We had a line up of seven people waiting for us to start at 1:00pm. People poured in and those asked to wait ate cookies, grabbed a coffee, and looked at DIY books. Some people had sentimental items fixed and others just wanted to save things they liked and didn't want to throw out. We had young and old come through the door. It really is a learning experience for all ages! Fixed Items: Mix master, small air compressor, steamer, mix master, dress, zipper on pants, fitted bed sheet, 2 headsets, 3 lamps, grow light, 2 bracelets, air purifier, massager, 2 board games, CD player speakers and a laptop got some trouble shooting. Unfixed Items: metal art piece, a Keurig coffee maker, an Ipad and an old sewing machine. 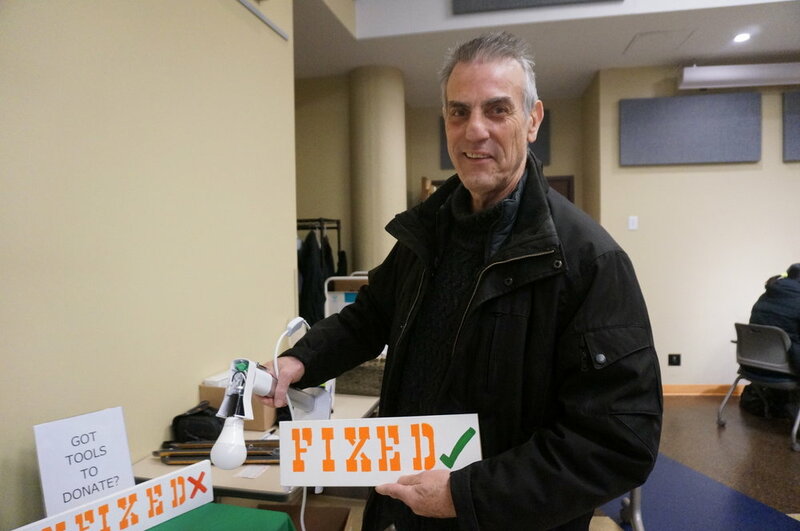 For items our fixers couldn't fix, we tried to give referrals for where to go for help locally when we could. At an event like this, you just never know what you are going to come across so it's hard to be fully prepared, but our Fixers got creative and put their heads and resources together, when necessary, to conquer a challenge. Residents were good at bringing any necessary repair materials along with them. "This is such a great idea!" "This is such a needed thing in our community! "It's a great place to meet people and learn what each others talents are"
"I need one of these every week for all the items I need repaired"
Our bike Fixer and small project table needed some more action at this café. Spring will be a great time to bring your wheelie things in for a tune up. At the next café we will offer shoe polishing, household battery testing (and you can leave your dead batteries for disposal), inflating station for balls, etc., and more. We will also have supplies like glues, staple guns, tapes, string, scissors, dowels, etc., and have someone assist you in your own repairs. We will also have a donation box into which you can drop any leftover supplies from your DIY project, so someone else can share your extra supplies. Hope to see you at the next cafe! Newer PostCountdown to grand opening: beautification time!